OXFORD, MS — Ole Miss saw its 2018 season come to a close Thanksgiving night in Oxford with a 35-3 loss to Mississippi State in the Egg Bowl. The game marked the ending of the collegiate careers of 19 seniors—players who in their freshman year were a part of the 2015 Sugar Bowl winning squad. The seniors, who have given an immeasurable level of dedication and time to the Ole Miss Rebel family, were honored before the game. A.J. Brown broke the all-time single-season receiving yards record against State, notching 85 for the year. To start the 115th Battle for the Golden Egg, the Rebels opened with possession and quarterback Jordan Ta’amu quickly went to the air on the first play, completing a 15-yard pass to A.J. Brown. Later in the game, the talented junior wide receiver broke the single-season Ole Miss reception record, previously held by Laquon Treadwell, before later setting the new benchmark at 85 receptions. With that said, the first Ole Miss possession ended with a three-and-out, and the Rebels handed the ball over to the Bulldogs and their senior quarterback, Nick Fitzgerald. The once Heisman-hopeful carried the ball for 28 yards on two attempts. However, State’s drive was stalled on a Keidron Smith pass breakup that forced the Bulldogs to punt the ball back to Ta’amu and company. Ole Miss fumbled, unfortunately, giving the Bulldogs the ball in good field position on the Rebels’ 45-yard line, and it did not take long for the Bulldogs to put the ball in the end zone to score the opening points of the game on a 6-yard rush by sophomore running back Kylin Hill. With five minutes remaining in the opening quarter, the Ole Miss offense trotted back on the field with a 7-point deficit and true freshman quarterback Matt Corral at the helm. Ta’amu was banged up on the previous drive with a finger injury, and because Corral had one game left before giving up his redshirt eligibility, the coaching staff was able to make the call to insert him in the game without it affecting his future eligibility. The Rebs, however, were unable to convert and once again punted to State. The obvious difference in the game at that point was the ability of the Bulldogs to run the ball, as they tallied 122 rush yards on the ground in the 1st quarter, alone, and took a 7-0 lead into the 2nd quarter–and were driving for more. That Bulldog series ended with an 8-yard rushing touchdown from Fitzgerald that put Mississippi State up 14-0 with 14:04 remaining in the second period. Following the Bulldog score, Rebel fans saw Ta’amu take the field after making practice throws on the sideline for the previous several minutes as he tested out his injured finger. Unfortunately, the drive came to a quick halt for the fourth time in as many tries, and the Rebels handed the ball right back to the Bulldog offense. 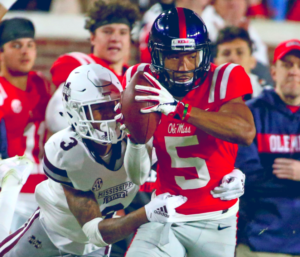 The Ole Miss defense forced a three-and-out for State, and the Rebels looked to put points on the board in their fifth possession of the game. Ta’amu found Dawson Knox, A.J. 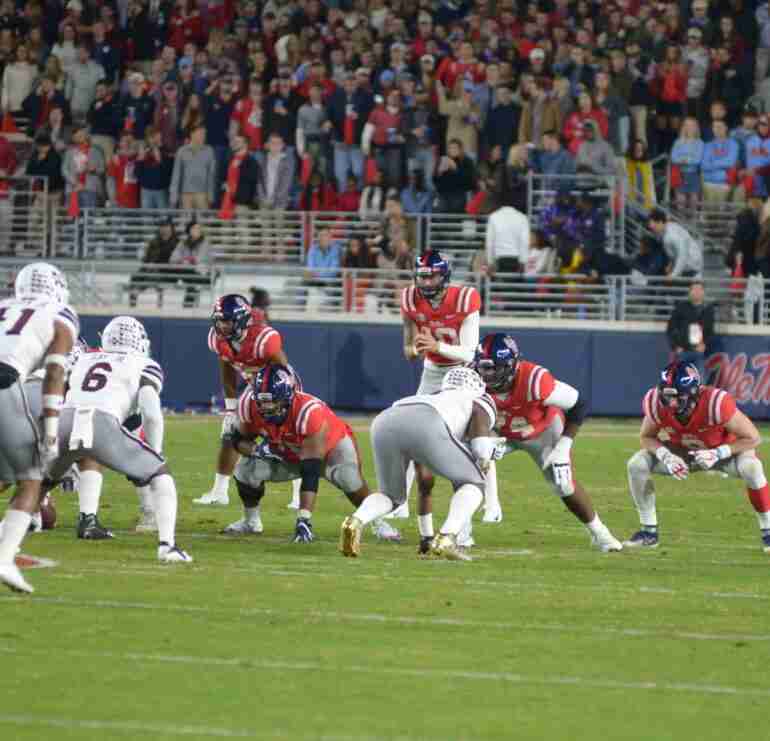 Brown, and DaMarkus Lodge on the series, eventually placing Ole Miss kicker Luke Logan in position to give the Rebels their first points of the game, which he converted, cutting State’s lead to 14-3. Following Ole Miss’ field goal, the teams traded three-and-outs, until a Bulldog drive essentially ended the first half of play with a 9-yard touchdown toss from Nick Fitzgerald to Deddrick Thomas, giving State a 21-3 as the rivals headed to intermission. At the midway point, Mississippi State had out-gained the Rebels in total yards, 247 to 131. The biggest disparity came on the ground as the Bulldogs out-rushed the Rebs, 184 to 18. The Bulldogs received the opening kick of the second half, and the Ole Miss defense stopped State and forced a punt. However, on the Rebels’ ensuing possession, Ta’amu threw an interception that gave the Bulldogs the ball on the Ole Miss 19-yard line. Fitzgerald soon took the ball in for his second rushing touchdown of the contest, giving State a 28-3 lead with 10 minutes left in the third. On the next Ole Miss possession, Corral made his second appearance of the game, as Ta’amu was unable to play due to what was later described as a dislocated finger on his throwing hand. The drive ended on a failed 4th down attempt. Later, in what could possibly summarize the 2018 season in a nutshell, Corral threw a bullet 48-yards down the field in what appeared to be a touchdown to Lodge—only to have the ball ripped away at the last second by a Bulldog cornerback in the end zone, in what was the first interception of Corral’s young career. If that wasn’t crazy enough, the following possession saw pure madness on the field for both teams. After a thorough review by officials and SEC replay staff, here is a summation of what happened on what turned out to be a “no-play” that truly defines this game (if not, season) as a whole. Corral found A.J. Brown on the left sideline for what seemed to be another incredible touchdown catch. Following what appeared to be an Ole Miss touchdown, a bench-clearing brawl sent both teams flying onto the field, with punches being thrown by each. After the field was cleared, the referees charged every single player on both teams with an unsportsmanlike conduct foul. Mississippi State’s Jamal Peters, Cameron Dantzler and Willie Gay were all ejected. Ole Miss’ injured cornerback C.J. Moore, who was lost for the season with a torn biceps earlier this year, was ejected. Penalties offset. Touchdown—or so it seemed. The original touchdown was soon reviewed, and it was ruled the Rebels did not snap the ball before the third-quarter clock expired. Therefore, the A.J. Brown touchdown was reversed. What were we left with? – four ejections, no touchdown, and an end of the quarter. The result of the Ole Miss drive, after all of that craziness, was a three-and-out that gave the ball back to Mississippi State who led Ole Miss, 28-3, at that point. 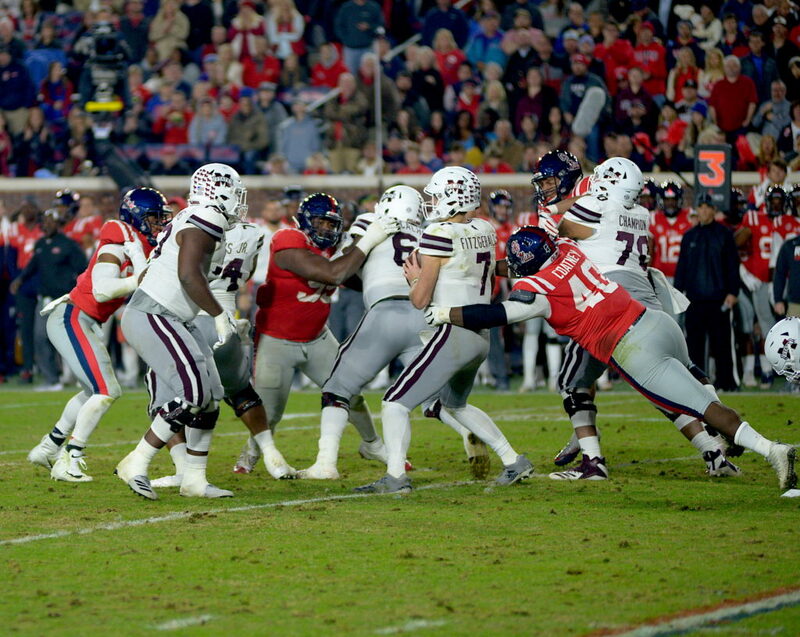 State’s ensuing drive and touchdown gave the Bulldogs a 35-3 lead that put the nail in the coffin on both the 2018 Egg Bowl and the Rebels’ season. The final play of the game involved unsportsmanlike conduct penalties on both sides, as well as the image of a gathering of Mississippi State players as they watched their teammate plant a MSU flag on the 50-yard line. O• QB Jordan Ta’amu, who was limited due to an injury, finished the game 8-of-17 for 87 yards. • Ta’amu passed for 3,918 yards in 2018, finishing second on the single-season charts in passing yardage. • Ta’amu finished his career ranked sixth in program history with 5,600 career passing yards. • Matt Corral was 5-of-8 for 65 yards filling in for Ta’amu. • WR A.J. Brown caught four passes for 61 yards. 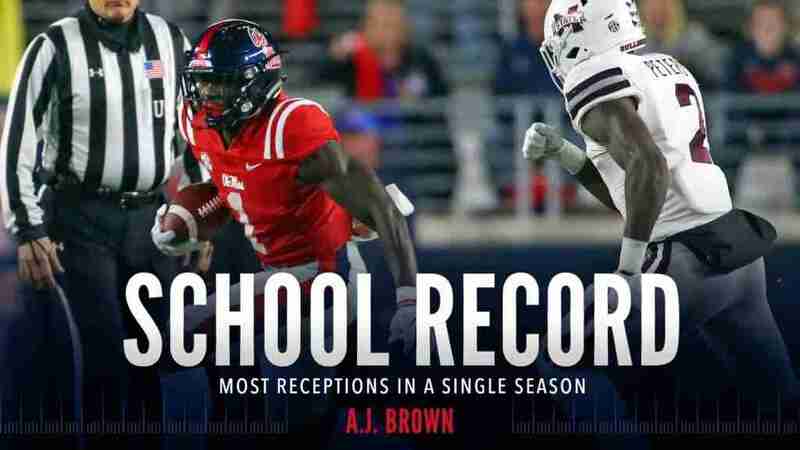 • Brown passed Laquon Treadwell’s single-season receptions record with 85 catches on the year. • Brown finishes the season with an Ole Miss single-season record of 1,320 receiving yards. • Brown is No. 1 on Ole Miss’ career receiving charts with 2,984 yards. • WR DaMarkus Lodge hauled in three catches for 54 yards. • Lodge finished in ninth place in Ole Miss’ record books in single-season receving yards (877). • Lodge finishes his career with 1,790 receiving yards. • Lodge tied for eighth in single-season receptions (65). • RB Isaiah Woullard carried 11 times for 63 yards. • DT Josiah Coatney had a team-high and career-high 12 tackles. • DB Zedrick Woods tallied nine total tackles in his final game as a Rebel. • DE Ryder Anderson set a career high in both tackles (nine) and tackles for loss (1.5). • Sanogo is just the second Rebel in the last 12 years to tally 100-plus tackles in a season. • K Luke Logan was 1-of-1 on field goal attempts and finished the season tied for second in school history with 22 field goals on the season. • Logan finished the season with 111 total points scored, the third-most in a single-season by a Rebel. • P Mac Brown punted six times for an average of 43.7 including a career-long of 65 yards.